Today I have to work at the shop for an hour or so first thing this morning, but then I'll get the rest of the day off to do my errands and laundry and have my weekly phone call with Aearwen. Next week I won't get a day off because Chickie will be taking vacation, and the week after that I'll be in Milwaukee attending the Bead & Button Show so I guess I'd better enjoy today - it's something I won't have the chance to have again for several weeks. This fountain is outside of the town hall in Christchurch, New Zealand. How lovely. I have been diving back into my research for my novel and am finding some timeline issues, but I think I'll manage to make it work. I may have to delete one area from the places my characters travel through/live in, but I may still be able to include it sideways instead of head-on. It's good to be back at the research though. I'll arrange for my interlibrary loan books right before I go to Milwaukee so that they can arrive after I'm back in town. gravity-fed fountains and effects - just stunning. Apparently this tree fools visitors often - LOL. I've mentioned, of course, how much I've been enjoying Lynn Flewellen's Nightrunner books. I was delighted to find out yesterday that she has a sixth book in the grouping and it is being published in a week! Of course, I went ahead and pre-ordered it for my NookColor. Oh happy day! LOL. Now if I could just find a topic or two to write some fanfic about since I'm really tired of revising my B2ME stories to make them fit for more general human consumption :-) But revision is a part of the game and necessary. Have a great day and enjoy the fountains (I felt like fountain pics today for some reason). Current Location: Trying to fight depression today...NOT good. I love the photos, especially the first one. 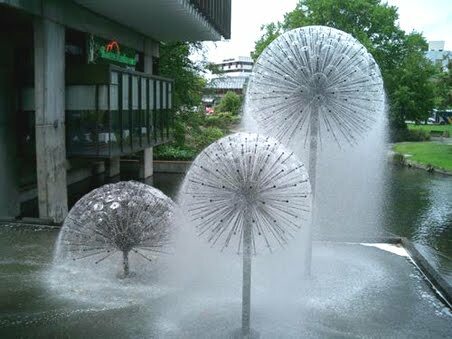 Those fountains remind me of dandelions - is that the right word? Yes, dandelions is indeed the right word and the perfect reference. The fountain in the second one actually goes all the time, it is a gravity-fed fountain. 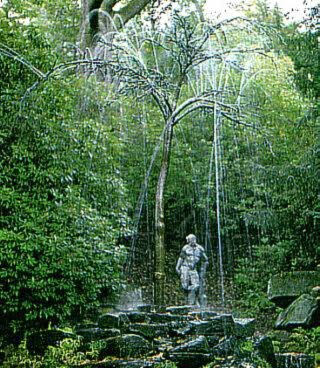 But people mistake it for a real tree and come too close, not realizing that the fronds are water instead of leaves in the midst of the willows. I should think about NaNo now instead of it being a late October reflexive choice. At least I could decide if I'm going original fiction this time or writing fan fiction again, though I don't think outlining the story this early would work for me. I can't wait for Ardor in August just to have something different to write. My NaNoWriMo is planned to be an original mystery fic, but it also takes place at one of my busiest times of the year - retailers have to make money during November/December or we're out of business. It's when I work extended hours and fitting that much wordage into a tight time slot like that - it might not be possible. Still, I'm willing to have a go. That dandelion fountain is exquisite. I hope you enjoy the B&B show! Isn't it stunning? The B&B Show will be my reward for working a five-day straight streak next week without my assistant manager. I always have to work harder with just my manager there because he doesn't interact with the customers at the same level that she does which leaves a lot of extra work for me to pick up on. The dandelion fountain is so pretty - I want one! Those are gorgeous fountains! I love fountains so much; thanks for sharing these. I adore fountains and I'm so pleased that so many of my f-list also do. I'll try to remember to include them in my regular rotation of things I post when I need to pull out of threatening depression so that you're not always getting hit by mountains, waterfalls and weather things. I hope you're able to soon leave the threating depression in your wake. I know that can be quite hard. Oh, and I was so excited about the fountains in my first comment that I forgot to say: Yay for interlibrary loans! There's something delightful about anticipating their arrival. Oh, aren't they equally stunning at night! What beautiful water. I try to push through depression because I really don't have the time to coddle myself and because it is silly to even try. When I allow myself to truly fall into depression, I get quite scary. So I push it away by focusing on beauty and doing things like writing and artwork. Hear, hear. It took me a lot of missed opportunities in life to begin to learn this lesson.